The Durham Attack U15 Boys braved the snowy 401 last Saturday and travelled to Kingston to compete in the McGregor Cup. 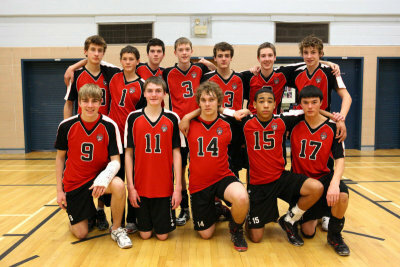 Having been relegated at the Provincial Cup in December the U15s had much to prove! The U15s struggled in their opening set against a solid North Bay team, losing quickly 25-10. However the boys showed perseverance and came back to win an exciting 2nd set 25-23! The split with North Bay provided much-needed confidence as they went on to defeat Markham 25-21, 25-22 and the Helios 25-19, 25-23. These important results set up an important match against the Mavericks that would determine which team will be promoted back to the premier division! The U15s played their best volleyball of the tournament and with an all court game that displayed both tremendous offence and defence solidly defeated a strong Maverick team 25-18 , 25-15. Coach May was pleased with the overall performance of the team and the fact they earned promotion to the premier division. There were many outstanding individual performances that enhanced the team’s results at the McGregor Cup. Sam Kloke and Luke Amos provided consistent setting that helped unleash a devastating offensive attack. Sam and Luke also chipped in with timely hits and owned the right side of the net with crazy blocking! Left Sides Ryan Skelly, Dan McNeill, Alec Brandwood and Adam Burford contributed with crunching kills, big digs and effective passing! Middles Bailey Higgins, Kyler Woodburne and Nick Pye dominated the net on both offence and defence. Solid passing allowed setters Amos and Kloke to run an effective quick middle attack. Defensively the middles came up with huge blocks taking away any hope of an opposition attack! Jeremy Williams and Wesley Armstrong displayed outstanding overall Right Side play with fantastic blocking, digging from the #1 position and kills when needed! Injured Zac Merritt-Misale assisted Coach May throughout the tournament. Next action for the U15s is Saturday February 5th as they travel to Etobicoke’s Kipling C.I. to compete in the Premier Division at the Challenge Cup!